One of the biggest hurdles you’ll face in running your own business is staying on top of your numerous obligations to federal, state, and local tax agencies. Tax codes seem to be in a constant state of flux and increasingly complicated. The old legal saying that “ignorance of the law is no excuse” is perhaps most often applied in tax settings and it is safe to assume that a tax auditor presenting an assessment of additional taxes, penalties, and interest will not look kindly on an “I didn’t know I was required to do that” claim. On the flip side, it is surprising how many small businesses actually overpay their taxes, neglecting to take deductions they’re legally entitled to that can help them lower their tax bill. The IRS doesn’t care if you pay the right amount of taxes or overpay your taxes. They do care if you pay less than you owe and you can’t substantiate your deductions. Even if you overpay in one area, the IRS will still hit you with interest and penalties if you underpay in another. It is never a good idea to knowingly or unknowingly overpay the IRS. The best way to “Audit Proof” yourself is to properly document your expenses and make sure you are getting good advice from a tax professional. While it used to be a red flag, this is no longer true–as long as you keep excellent records that satisfy IRS requirements. Because of the proliferation of home offices, tax officials cannot possibly audit all tax returns containing the home office deduction. In other words, there is no need to fear an audit just because you take the home office deduction. A high deduction-to-income ratio, however, may raise a red flag and lead to an audit. Whether it’s a missed estimated tax payment or filing deadline, an improperly claimed deduction, or incomplete records, understanding how the tax system works is beneficial to any business owner. And, even if you delegate the tax preparation to someone else, you are still liable for the accuracy of your tax returns. If you have any questions, don’t hesitate to call the office for assistance. 2. Contact your creditors. Let your creditors know you are having difficulty making your payments. Tell them why you are having trouble–perhaps it is because you recently lost your job or have unexpected medical bills. Try to work out an acceptable payment schedule with your creditors. Most are willing to work with you and will appreciate your honesty and forthrightness. According to a recent study published by the Federal Reserve Bank of San Francisco, researchers found that over a lifetime, the average U.S. college graduate will earn at least $800,000 more than the average high school graduate–even after taking into consideration the cost of college tuition and the four years of lost wages it entails. Despite this, most people still feel that a college education is worth the investment. That said, however, the need to set money aside for their child’s education often weighs heavily on parents. Fortunately, there are two savings plans available to help parents save money as well as provide certain tax benefits. Let’s take a closer look. Example: Suppose you have one child, age six months, and you estimate that you’ll need $120,000 to finance his college education 18 years from now. If you start putting away money immediately, you’ll need to save $3,500 per year for 18 years (assuming an after-tax return of 7 percent). On the other hand, if you put off saving until your son is six years old, you’ll have to save almost double that amount every year for 12 years. College is expensive, and proper planning can lessen the financial squeeze considerably–especially if you start when your child is young. According to the College Board, average published tuition and fees for full-time in-state students at public four-year colleges and universities increased 2.9 percent before adjusting for inflation, rising from $9,145 in 2014-15 to $9,410 in 2015-16. Average published tuition and fees at private nonprofit four-year institutions increased 3.6 percent before adjusting for inflation, rising from $31,283 in 2014-15 to $32,405 in 2015-16. Undergraduates received an average of $14,210 in financial aid in 2014-15, including $8,170 in grants from all sources, $4,800 in federal loans, $1,170 in education tax credits and deductions, and $70 in Federal Work-Study. The prepaid education arrangement. With this type of plan, one is essentially buying future education at today’s costs, by buying education credits or certificates. This is the older type of program and tends to limit the student’s choice to schools within the state; however, private colleges and universities often offer this type of arrangement. Unlike certain other tax-favored higher education programs, such as the American Opportunity Credit (formerly the Hope Credit) and Lifetime Learning Credit, federal tax law doesn’t limit the benefit to tuition, but can also extend it to room, board, and books (individual state programs could be narrower). There are no income limits on who may be an account owner. There’s only one designated beneficiary per account. Thus, a parent with three college-bound children might set up three accounts. Some state programs don’t allow the same person to be both beneficiary and account owner. Income Tax. Contributions made by an account owner or other contributor are not tax deductible for federal income tax purposes, but earnings on contributions do grow tax-free while in the program. A distribution may be tax-free even though the student is claiming an American Opportunity Credit (formerly the Hope Credit) or Lifetime Learning Credit, or tax-free treatment for a Coverdell ESA distribution, provided the programs aren’t covering the same specific expenses. Distribution for a purpose other than qualified education is taxable to the one getting the distribution. In addition, a 10 percent penalty must be imposed on the taxable portion of the distribution, which is comparable to the 10 percent penalty in Coverdell ESAs. Gift Tax. For gift tax purposes, contributions are treated as completed gifts even though the account owner has the right to withdraw them. Thus they qualify for the up-to-$14,000 annual gift tax exclusion in 2016 (same as 2015). One contributing more than $14,000 may elect to treat the gift as made in equal installments over the year of the gift and the following four years so that up to $56,000 can be given tax-free in the first year. Estate Tax. Funds in the account at the designated beneficiary’s death are included in the beneficiary’s estate, another odd result, since those funds may not be available to pay the tax. Funds in the account at the account owner’s death are not included in the owner’s estate, except for a portion thereof where the gift tax exclusion installment election is made for gifts over $14,000. For example, if the account owner made the election for a gift of $56,000 in 2016, a part of that gift is included in the estate if he or she dies within five years. Tip: A Qualified Tuition Program can be an especially attractive estate-planning move for grandparents. There are no income limits, and the account owner giving up to $56,000 avoids gift tax and estate tax by living five years after the gift, yet has the power to change the beneficiary. State Tax. State tax rules are all over the map. Some reflect the federal rules; some reflect quite different rules. For specifics of each state’s program, see College Savings Plans Network(CSPN). If you need assistance with this, please contact us. You can contribute up to $2,000 in 2016 to a Coverdell Education Savings account (a Section 530 program formerly known as an Education IRA) for a child under 18. These contributions are not tax deductible but grow tax-free until withdrawn. Contributions for any year, for example, 2016 can be made through the (unextended) due date for the return for that year (April 17, 2017). There is no adjustment for inflation; therefore the $2,000 contribution limit is expected to remain at $2,000. Only cash can be contributed to a Coverdell ESA, and you cannot contribute to the account after the child reaches his or her 18th birthday. Anyone can establish and contribute to a Coverdell ESA, including the child. An account may be established for as many children as you wish; however, the amount contributed during the year to each account cannot exceed $2,000. The child need not be a dependent, and in fact, does not even need to be related to you. The maximum contribution amount in 2016 for each child is subject to a phase-out limitation with a modified AGI between $190,000 and $220,000 for joint filers and $95,000 and $110,000 for single filers. A 6 percent excise tax (to be paid by the beneficiary) applies to excess contributions. These are amounts in excess of the applicable contribution limit ($2,000 or phase out amount) and contributions for a year that amounts are contributed to a Qualified Tuition Program for the same child. The 6 percent tax continues for each year the excess contribution stays in the Coverdell ESA. Exceptions. The excise tax does not apply if excess contributions made during 2016 (and any earnings on them) are distributed before the first day of the sixth month of the following tax year (June 1, 2017, for a calendar year taxpayer). However, you must include the distributed earnings in gross income for the year in which the excess contribution was made. The excise tax does not apply to any rollover contribution. The child must be named (designated as beneficiary) in the Coverdell document, but the beneficiary can be changed to another family member–to a sibling for example when the first beneficiary gets a scholarship or drops out. Funds can also be rolled over tax-free from one child’s account to another child’s account. Funds must be distributed not later than 30 days after the beneficiary’s 30th birthday (or 20 days after the beneficiary’s death if earlier). For “special needs” beneficiaries the age limits (no contributions after age 18, distribution by age 30) don’t apply. Withdrawals are taxable to the person who gets the money, with these major exceptions: Only the earnings portion is taxable (the contributions come back tax-free). Also, even that part isn’t taxable income, as long as the amount withdrawn does not exceed a child’s “qualified higher education expenses” for that year. The definition of “qualified higher education expenses” includes room and board and books, as well as tuition. In figuring whether withdrawals exceed qualified expenses, expenses are reduced by certain scholarships and by amounts for which tax credits are allowed. If the amount withdrawn for the year exceeds the education expenses for the year, the excess is partly taxable under a complex formula. A different formula is used if the sum of withdrawals from a Coverdell ESA and from the Qualified Tuition Program exceeds education expenses. As the person who sets up the Coverdell ESA, you may change the beneficiary (the child who will get the funds) or roll the funds over to the account of a new beneficiary, tax-free, if the new beneficiary is a member of your family. But funds you take back (for example, withdrawal in a year when there are no qualified higher education expenses, because the child is not enrolled in higher education) are taxable to you, to the extent of earnings on your contributions, and you will generally have to pay an additional 10 percent tax on the taxable amount. However, you won’t owe tax on earnings on amounts contributed that are returned to you by June 1 of the year following contribution. Considering the wide differences among state plans, federal and state tax issues, and the dollar amounts at stake, please call the office before getting started with any type of college savings plan. If you donate a qualified vehicle to a qualified organization, and you claim a deduction of more than $500, you can deduct the smaller of the gross proceeds from the sale of the vehicle by the organization or the vehicle’s fair market value on the date of the contribution. If the vehicle’s fair market value was more than your cost or other basis, you may have to reduce the fair market value to figure the deductible amount. If you’ve moved–or are planning to move–this year to start a new job you may be able to deduct certain moving-related expenses on your tax return. You may also be able to deduct these expenses even if you kept the same job but moved to a different location. 1. Expenses must be close to the time you start work. Generally, you can consider moving expenses that you incurred within one year of the date you first report to work at a new job location. 2. Distance Test. Your move meets the distance test if your new main job location is at least 50 miles farther from your former home than your previous main job location was from your former home. For example, if your old main job location was three miles from your former home, your new main job location must be at least 53 miles from that former home. 3. Time Test. Upon arriving in the general area of your new job location, you must work full-time for at least 39 weeks during the first year at your new job location. Self-employed individuals must meet this test, and they must also work full time for a total of at least 78 weeks during the first 24 months upon arriving in the general area of their new job location. If your income tax return is due before you have satisfied this requirement, you can still deduct your allowable moving expenses if you expect to meet the time test. There are some special rules and exceptions to these general rules. Please call if you’d like more information. 4. Travel. You can deduct lodging expenses (but not meals) for yourself and household members while moving from your former home to your new home. You can also deduct transportation expenses, including airfare, vehicle mileage, parking fees and tolls you pay, but you can only deduct one trip per person. 6. Utilities. You can deduct the costs of connecting or disconnecting utilities. 7. Nondeductible expenses. You cannot deduct the following moving-related expenses: any part of the purchase price of your new home, car tags, a driver’s license renewal, costs of buying or selling a home, expenses of entering into or breaking a lease, or security deposits and storage charges, except those incurred in transit and for foreign moves. 8. Form. You can deduct only those expenses that are reasonable for the circumstances of your move. Don’t hesitate to call if you have any questions about deducting moving expenses or need help figuring out the amount of your deduction for moving expenses. If you use part of your home for business, you may be able to deduct expenses for the business use of your home, provided you meet certain IRS requirements. 5. If you are an employee, additional rules apply for claiming the home office deduction. For example, the regular and exclusive business use must be for the convenience of your employer. If you’re not sure whether you qualify for the home office deduction, please contact the office. Help is only a phone call away. Don’t hesitate to contact the office if you have any questions about the Premium Tax Credit. QuickBooks was designed to be used by millions of businesses. In fact, it’s possible to install it, answer a few questions about your company and start working right away. However, we strongly suggest you take the time to specify your Preferences. QuickBooks devotes a whole screen to this customization process. You can find it by opening the Editmenu and selecting Preferences. Figure 1: This is the screen you’ll see when you go to Edit | Preferences in QuickBooks. You can turn features off and on, and customize the software in numerous other ways. Warning: While the mechanics of this process are simple, there may be times when you don’t understand what’s being asked because you’re either not familiar with the terms or you don’t know which option you should choose. Rather than guessing, please connect with us to set up a time to go over all of the content in the Preferences window. Figure 3: If you are creating an invoice for a customer who has received services but who has not been billed for them yet, you can opt to have those charges added to the invoice. You’ll notice that there’s a box in the lower left corner labeled Save this as a preference. 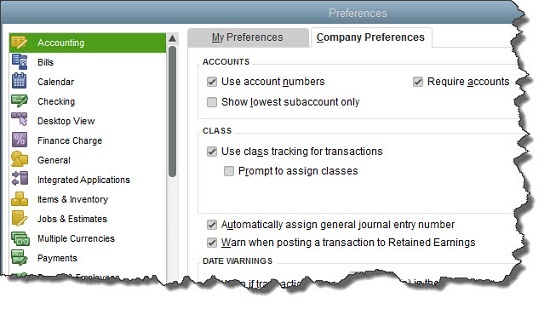 While QuickBooks allows you to specify preferences in countless areas in the Preferenceswindow, you will often have the opportunity to make an exception for a particular action as you’re working on transactions. Also, as shown here, you can sometimes turn on specific preferences once you’ve already started a task. It’s a good idea to learn about all of your options in the QuickBooks software before you get started–and we can help. If you let us go through this process with you, you’ll not only learn about the customization allowed, but you’ll also get a good introduction to all of the things that QuickBooks can do, and learn more about your business and its needs. Need help? Don’t hesitate to call! Employers – Social Security, Medicare, and withheld income tax. File Form 941 for the second quarter of 2016. This due date applies only if you deposited the tax for the quarter in full and on time.